Cold weather dries out skin, resulting in a dull & dry complexion. The best way to combat winter skin is with a hydrating skin regime. 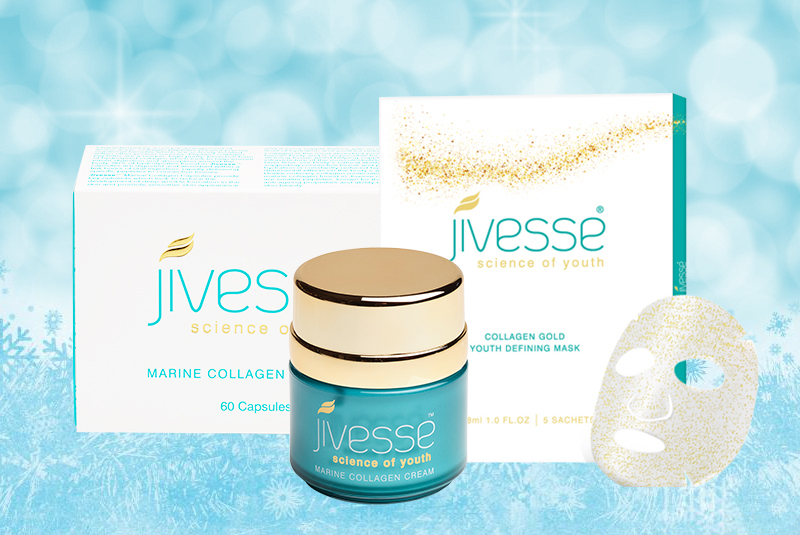 Jivesse is your winter skin saviour. The luxuriously thick Jivesse Marine Collagen Cream is the perfect daily moisturiser. Containing collagen peptides that are easily absorbed, collagen production is improved resulting in firmer, suppler skin. It is abundant in humectants which attract and retain moisture from the atmosphere via absorption, drawing the water vapour into and beneath the skins surface to prevent excessive drying. This keeps the skin elastic and thus plumps up and tightens skin. Glycerine maintains the skin’s water balance leaving it feeling softer, suppler and overall healthier. The cream can be used alone, but for enhanced results, Jivesse capsules work from within to help boost collagen production. These collagen capsules also contain Hyaluronic Acid (HA). HA also helps support collagen production further improving levels in the skin. Hyaluronic Acid also improves skin hydration. Together, collagen stores & HA stores are increased resulting in a much healthier, hydrated, youthful-looking complexion throughout winter. Collagen supports the skins structure. Without it, skin begins to sag and wrinkles & fine lines appear. These visible signs of ageing generally occur if skin is damaged, for instance from over-exposure to the sun, or simply with age itself, because with age, collagen levels deplete naturally. It is therefore important to maintain collagen levels throughout life in order to maintain a youthful complexion. Hyaluronic Acid is an effective skin hydrator. Just like any other humectant it helps skin retain moisture allowing dull, dry skin to become luminous, hydrated and supple. One of the main antioxidants found in Jivesse that will counteract skin damage caused by cold weather is Vitamin C. The Kakadu Plum, in Jivesse Marine Collagen Cream, contains the largest amount of Vitamin C found in any plant. As well as protecting the skin against free radicals, Vitamin C aids the growth of cells and blood vessels and contributes to the strength and firmness of the skin. It also contains Avocado and Pomegranate Seed Oil which are high in key anti-oxidants that aid skin rejuvenation and promotes cell renewal & regeneration. These benefits all contribute to healthier looking skin throughout winter. This British brand is only stocked in the most prestigious retailers including, Harrods, John Bell & Croydon, Selfridges and Revital. Made in the UK, Jivesse is proud to offer the best in British skincare for anti-ageing and skin health. Our ingredients are clinically proven to work, created by dermatologists for a range of skin care needs whether that be dull, dry skin, premature skin ageing or post-acne breakouts. Jivesse puts skin health first. This luxurious brand will have winter skin looking luminous in no time at all.